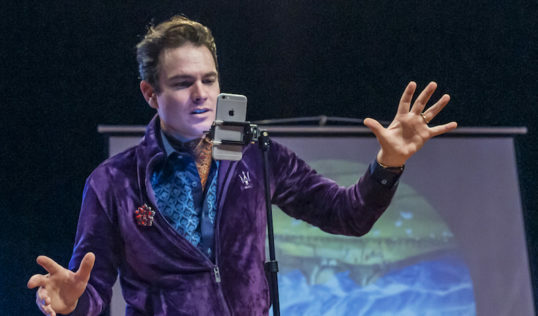 Promising a mixture of old and new technology and material, Erewhon at Summerhall fails to ignite fully, but remains an engaging and amiable production. Arthur Meek’s reworking of Samuel Butler’s 1872 book was first seen in US-based Meek’s native New Zealand. This is appropriate, since that country provided much of the inspiration for Butler’s Gulliver’s Travels–ish satire of contemporary society. Arthur Meek. Pic Erik Norder. This adaptation was originally commissioned by Edinburgh’s Magnetic North as part of a Scotland/New Zealand playwright exchange with funding from Creative New Zealand. 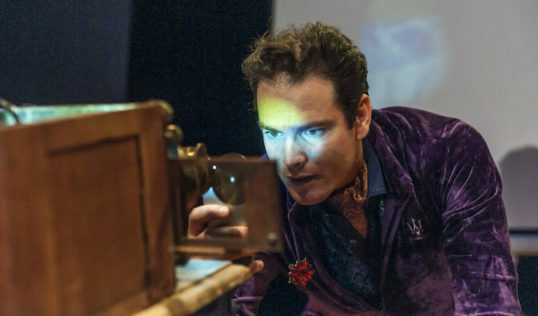 The original story features an unease with technology that is also present here, and the combining of past and present is reflected by the use of both a Victorian magic lantern and an iPhone in the staging. This is further explored in a tricksy time-travel framework that does not always quite gel. Similarly, the self-referential persona of Meek’s narrator, full of guilt at being a straight white man, can be a trifle glib. The use of the iPhone, moreover, seems unnecessary, with an invitation to the audience to use their own phones falling flat. The suggestion that modern humans are in thrall to their smartphones could be made in a more subtle way than having a play that features a phone just because the writer has got one. The wilfully homespun feel provided by the magic lantern does work beautifully, however, enhanced considerably by a collection of slides contributed by a collection of artists from around the globe. When the more meta stuff is ditched, and Meek sticks to storytelling, he cuts a compelling figure in his purple velour tracksuit and cravat. There is an invitingly attractive complicity in his onstage manner that recalls some of the best children’s shows. Indeed, bar a couple of definitely adult moments, there is something of that air about the whole enterprise. 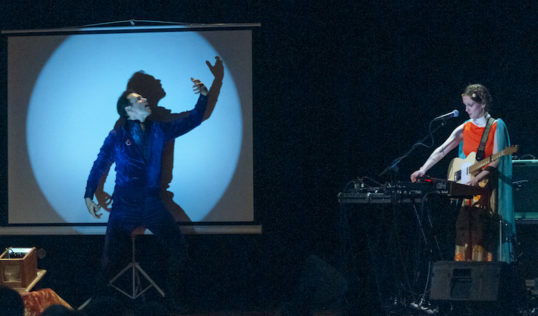 Eva Prowse’s live musical accompaniment, inspired by 1980s synth-pop, is equally likeable, and Nicholas Bone and Geoff Pinfield’s direction is sure-footed. The anti-colonial message of the piece is clear enough without being spelled out at the start – although, since the peculiar attempts to rehabilitate the British Empire by Michael Gove and his ilk, it doesn’t hurt to reinforce it. 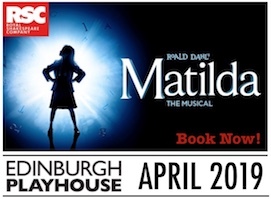 This temptation to lead the audience by the nose is the downfall of an otherwise wholly likeable and enjoyable production, that will please many without being earth-shattering. Daily at 1.25 pm (not Mondays). Arthur Meek and Eva Prowse. Pic: Erik Norder.